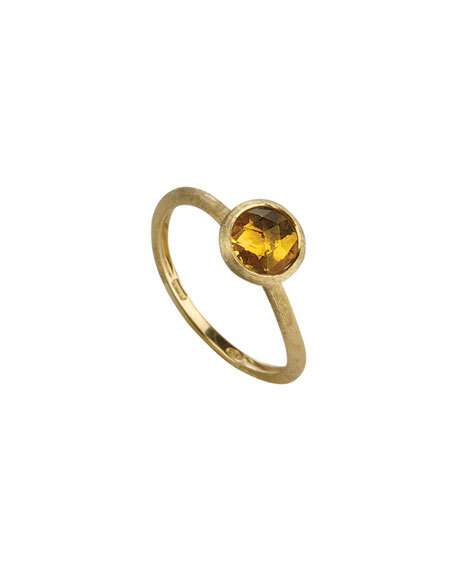 Marco Bicego stackable ring in hand-engraved 18-karat yellow gold. Rose-cut cushion citrine center, approx. 0.3". Inspired by a tropical Indian sunset and the stonecutting heritage of Jaipur, the Jaipur Collection is characterized by its multicolored, prism-cut gemstones. Each stone originates from the "pink city" of Jaipur, where expert stone cutting has been perfected over the ages. The city's specialist engravers employ a tradition of drawing beauty and light from every stone, producing the ideal cut. Each is deliberately distinct and equally precious, having been carefully selected from many. In keeping with Marco Bicego signature collections, the gold is strictly 18-karat, artfully chiseled by hand, and rendered even more beautifully irregular, organic, natural, and contemporary.